More and more, the music we hear being produced and aired today is a hybrid of the traditional “band” sound and the now well-established electronic studio beat. Although the concept of a beat is well understood, as it’s front and centre in most genres of music, the creation is not always so obvious. Beyond the Beat’s new Beat Making Program is a marriage of the traditional and the modern styles. It offers students an in-depth look at the world of DAW-based production and real-life instrument playing. This awesome program seeks to inspire its participants into thinking like a musician, and composing the same kind of music we hear on the radio. The Beat Making Program teaches you how to make the sound you’ve been looking for. Beat Making is taught using state of the art technology and equipment, in studio, in groups of two students or individually. Please call the studio to discuss availability, pairing and pricing. What is Beat Making? Is it the future of studio production? It might sound forward-looking, but it seems like a necessity at this point. I’ve been getting pretty heavily involved in the world of production and Beat Making and had a lot of conversations gauging how other musicians feel about where the industry is at. More importantly, what I found with most of my students has been that 60-70% of the music they listen to is very heavily produced electronically. That’s just a reflection of the music industry today so it’s pretty key now that kids learn it. How is it different from the Production Program? You might see the Production Program as a little more geared towards singers and songwriters who’d like to flesh out their original music, working one-on-one with a producer. In Beat Making, the students I’ve been working with are very interested in composing hands-on using the DAW software and this gives them an avenue to do that. There’s certainly a lot of knowledge that translates from an instrument to the world of beat making, but this is where students take in what they hear and put those layers together to make something unique. There must be a lot of state of the art technology. The program is running off laptops using ProTools, Reason, Ableton Live, DAWS Programs and we’re also using a program called Maschine as a mainstay, which has integrated hardware that essentially is a midi-controller but also functions as a way of organizing a song. It’s been described as a ‘mouse with many buttons.’ It’s a lot of fun and takes the experience to another level. How does the software work; can I make anything? You really can. If there’s one problem with it, it’s that there are no limitations. Anything you can think of in your mind, anything you can imagine, any sound you want you can pretty well go about making that sound if you have the technique (the production chops) to do so. And you can learn and build that through the Beat Making program. Through a series of really interesting experiments you try along the way, you discover certain sounds, you log them away, and bring them back later to blend with something else. It’s a really fun process. Why teach Beat Making in pairs? I’ve been approaching it as working in pairs of students because I think there’s an underlying lesson that’s important when you’re making music, and that is other peoples’ perspectives. It’s definitely cool to be an artist with a clear and individual vision, but I like the idea of beat makers specifically working as a group because it opens up the world of expression and learning. We’re treating beat making almost like it’s a miniature band; it’s collaborative. Socially, what that does is bring in a different dynamic that, in my opinion, also makes it more fun. What do I need to know to take this program? The only criteria are maturity. It’s not an age limit. You’ve got to be able to come in and work with someone else with the intention of learning. There’s no prerequisite knowledge but there’s a side to it that’s technical and takes a bit of focus. If you can hear rhythm or something about music that you’re latching onto that makes you want to say, yeah I’d like to learn this and I’d like to make a piece myself, then you’re already halfway there because you have the taste for it. You have the ears and the sonic understanding to say there’s more than just something I want to sing along with, there’s these other textures, and you’re interested in how that might work. And then there’s the actual special knowledge of how to put it together that is integrated into the course. There’s a theoretical knowledge of how rhythm works and theoretical knowledge of how harmony works and that’s pretty easy to pick up if you’re ready for that. 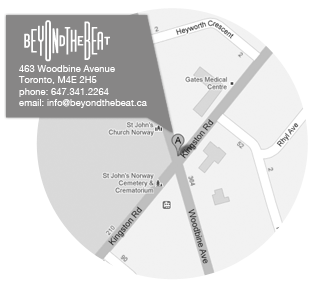 To register for Beat Making or find out more about it, contact Beyond the Beat at info@beyondthebeat.ca or call us at 647-341-2264.